A strong cold front will bring a burst of wintry weather to southeastern Australia at the end of this week, including rain, hail and a dusting of snow. 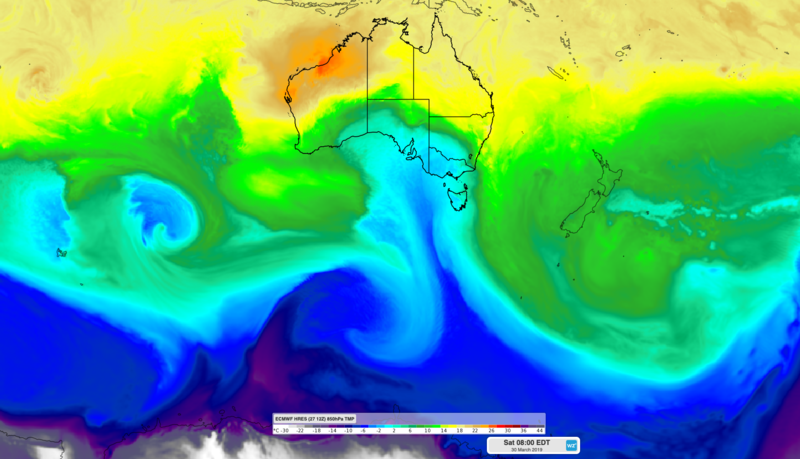 A pool of cold air from the Southern Ocean will pass over Australia's southeastern states on Friday and Saturday. A cold front at the leading edge of this wintry air mass will reach South Australia on Friday morning, before passing over Tasmania and Victoria during Friday afternoon. The front will then spread across NSW on Saturday. ECMWF-HRES model showing cold air crossing southeastern Australia on Saturday morning. Rain will develop ahead of the approaching front, although once the colder air arrives, temperatures will drop low enough to turn some of this rain into snow and small hail. It should get cold enough for snow to fall down to about 1,100 metres above sea level in Tasmania, Victoria and southern NSW on Saturday. There should be enough moisture in the atmosphere to produce about 2-5cm of snow at some of Australia's main ski resorts, offering an early taste of the season ahead. Hobart and Melbourne are both forecast to reach tops of 15 degrees on Saturday. If the temperature stays under 15.3 degrees in Melbourne, it will be the city's coldest March day in 41 years. Wind chill will exacerbate the cold weather across most of southeastern Australia on Saturday. Then, as the wind eases overnight and the cool air lingers, many locations in NSW and eastern Victoria will experience their lowest temperature so far this year on Sunday morning.